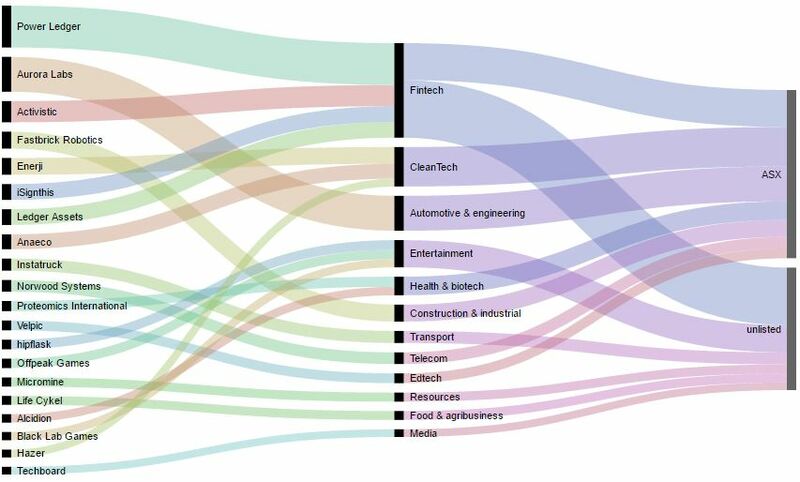 Fintech and cleantech are the most trending sectors this fortnight, with six of Techboard’s top eight companies represented (Power Ledger, Activistic, Enerji, iSignthis, Ledger Assets and Anaeco). Power Ledger’s other co-founder is City of Perth councillor and 40under40 winner Jemma Green, who is also involved with a range of clean energy organisations including Future Super, The Green Enterprise, Carbon Tracker – as well as Heritage Perth. Both companies were widely covered in the press, with Power Ledger also seeing strong social media engagement. Aurora Labs is Techboard’s second most trending startup, having had a very strong start to its first couple of days as an ASX listed company, up 250%. The company makes metal 3D printers. Listed fintech Activistic (ranked 3rd) is a micro donations platform provider, and has announced a capital raising of $3.65 million. The funds raised will enable it to continue the commercialisation of its Veterans Call app in the US. Filtering out all ASX listed companies, the adjusted top five features on demand truck matching service Instatruck, which picked up a couple of nominations from Techboard’s Panel of Experts, and hipflask and Offpeak Games, both pitching at tonight’s Innovation Bay event.